One by one, they entered the glittering jewel-box of the throne room, with its brightly polished floor of green marble permeated with golden veins, and a solitary gilded chair on a three-tiered dais – a piece of furniture that looked more like the perch of an exotic songbird than the royal throne. Seven in number, they moved as a single entity, or, rather, like the gears of a fine clock, oiled and tuned to high precision. Their faces were grim, for although sometime during the night – while the mutilated body of the unfortunate human was cleansed and inspected by the High Priestess, and the Queen regained her composure – they had been given time to exchange their bloodied armor for the courtly finery, the recent tragedy weighed heavily on their minds. Even in their subdued state, they walked with a quiet economy of grace, their every motion elegant and precise, demonstrating, as ever, how they had earned their reputation of Suldanessellar’s finest rangers. Mute and reserved, the six brothers and their young cousin strode to the dais in a single file; then, kneeled on the soft carpet before the Queen’s empty chair, as smoothly and silently as they had entered. Elven custom did not normally require such complete subjugation before a monarch, but perhaps the brothers’ sense of guilt sought honor in humiliation. Their final reckless attack on the owlbear, which Bodhi had witnessed from above in the course of her amazing rescue, and the eventual killing of the beast, had not saved King Errilam. The Seven had lost their charge, and suffered considerable injury, dealt both to their pride and their bodies. The second youngest of the group, a dark-haired elven youth with a habitual scowl upon his pale, handsome face, favored his sword hand, which hung inside the embroidered sleeve of his fine tunic like a broken tree branch. The bronze-skinned, blonde twins, muscular and agile, helped him to settle down, bracing him between their shoulders. The rest of the company, including young Sovalidaas, sported an impressive variety of minor injuries, but none had been wounded as seriously as Elhan, whose arm had been nearly torn out of its socket. Upon their return to Suldanessellar, the curative magic of the priests had stabilized his condition, but only to a point. The oval-shaped throne room was empty, and in its cool quietude the kinsmen settled for a long wait. Pale-green globes of fine crystal set into the throne’s armrests filled the chamber with waves of shimmering light that gave every object in the room a hazy, two-fold shadow; the only sound was the gentle trickling of the fountains that lay on either side of the entrance. Finally, the painted silk screen behind the dais slid aside, letting in the fragile figure of a woman wrapped in dark grey mourner’s silks. Grave and silent as a ghost, Ellesime glided to her throne, ignoring the kneeling seven, and Astalder noted that the Queen’s eyes looked as lusterless as her clothes, and that her fire-fall of russet curls was bound and hidden beneath a dark headscarf. “Many who were at the clearing at the time of the… accident saw the arrow change direction in plain view before striking the King’s horse,” Astalder said simply, and shifted his eyes. He expected Ellesime to object, but instead saw her nod in reluctance, admitting her knowledge of the fact. She must have received a detailed report, concerning the details of the fatal hunt, while they were waiting for the interview – he realized belatedly. Something bothered him greatly about her sudden outburst of anger, but he knew better than to voice his suspicions. “The boy is not accusing anybody, my Queen. He is simply answering your questions.” The voice that uttered this latest sentence came from beside the same silk screen from which the Queen had appeared earlier, yet, so unobtrusive had been the speaker’s entrance, and so tense was the atmosphere in the throne room, that none present could have said with certainty at what point he had arrived. The newcomer was tall, thin and dressed in plain dark clothes, relieved only by an elaborate gold-and-emerald cloak pin, depicting a bird’s tail-feather. Since the People do not age in the same way that other races do, it is usually impossible to judge the elf’s age merely by her appearance. Yet one look at Duke Menerlim Goldfeather’s face gave the observer an unshakable impression of old age. Admittedly, his ageless face lacked visible traces of wear usually associated with ageing. His skin was as smooth and flawless as that of his sons’, his teeth perfectly white and even. But perhaps there was something about his eyes that betrayed the lurking fatigue – a hint of loneliness, and a yearning for some place that was both brighter and more vibrant than Toril. His shoulder-long hair was white, but not of the transparent, silver or platinum hue, sometimes seen among the moon elven subrace, but rather of the color of polished ivory, or the clear beeswax. However his physique, while lessened by age, was by no means frail, and beneath the layer of weariness lay the iron bearing of an old soldier. Something shifted within the Queen’s eyes just then, and Astalder thought that the briefest of moments, Ellesime’s golden face had lost its divine glamour, and was about to crumble in despair. But an eye blink later it was gone, and the Queen managed to pull herself together, staring down the chief commander of her troops until Duke Menerlim lowered his eyes, admitting her seniority. Perhaps this small victory over the audacious general played a role in her change of mood, since she nodded, conceding to his plea. “My lord Duke, I have every intention of following through with this inquest,” Ellesime replied simply. “Fear not. I will hear the testimony of everyone who was at the site, including that of Lord Ithilnien.” Her voice was quiet and composed, as if the possibility of her consort being involved in the killing was of no concern whatsoever. Joneleth had never been popular among Ellesime’s courtiers, primarily due to his aloof and arrogant manner, which had earned him more enemies than friends. Admittedly, the mage claimed friendship of the young silver dragon, and had the grumbling admiration of a few oddballs among the nobles. But the majority of them treated him with suspicion. His sheer strength in the Art of the Arcane was such that no one dared to openly challenge his position. However, Joneleth’s political influence in the green-elven kingdom of Suldanessellar was weak, as he hailed from an obscure branch of an immigrant family of moon elves, whose riches and authority had been completely lost after the fall of Myth Drannor. To make matters worse, Jon had spent most of his formative years at the Evereskan Academy of Magic, away from the city-in-the-treetops, and upon returning had never bothered to re-kindle old friendships or make new ones. Despite this, the Archmage was venerated by many of the simple folk: gardeners, rangers, hunters, and craftsmen admired him, because he was the city’s most powerful mage, and because they found the story of his relationship with the Queen extremely romantic. Ellesime was the daughter of the Seldarine, and whoever was the beloved of the Queen was automatically adored by the mob, and granted, (in their eyes at least), a share of her divinity. Even the Archmage’s staunchest adversaries, among whom Menerlim Goldfeather occupied a prominent position, had never questioned the strength of the mage’s bond with Ellesime. Sometimes the general wondered if the daughter of Rillifane had chosen Joneleth as her consort because it had been the only way to keep the haughty mage in check. Even in the privacy of his mind, Duke Menerlim could not truly accuse the Queen of manipulating her lover – Ellesime had demonstrated the strength of her affection for Joneleth time and time again – yet the theory was not without merit. The scale of the Archmage’s arcane powers was immense, but his loyalty to Suldanessellar beyond his devotion to the Queen was uncertain. Master Ithilnien took no apprentices from the city’s stock of young mages, preferring the half-breed whom he had brought from Evereska, and making an exception only for the silver dragon whelp. His cooperation with the Council of Elders was nonexistent, he had no respect for his betters, and even the Archmage’s contacts with Suldanessellar’s other mages were invariably at his sufferance. For Duke Goldfeather, Joneleth was an enigma: a powerful but capricious ally at best, a potential threat at worst, and the general did not like puzzles that he could not solve in three moves. Recently, the Archmage had been spending the lion’s share of his time scouring Suldanessellar’s temples for their most ancient archives, and the Seldarine only knew what secrets of the city’s past he had already unearthed. The Lord Constable was worried, for some of these chronicles likely held information related to past concords of many of Suldanessellar’s most influential clans, and that information was sensitive. A long time ago, there had been rumors that Joneleth’s passion for the Queen had been his only reason for calling off his planned departure to Evermeet, and remaining in the city. If that bond was somehow broken, perhaps the Archmage could be persuaded to depart? That is, if he were not found guilty of premeditated murder, and sentenced to exile or worse. The Queen had been content with her choice for decades. But now it appeared that Ellesime’s fury was capable of overcoming her affection, and eventually, the Queen’s disappointment with her lover might lead to a major realignment of power at Suldanessellar’s Court. Duke’s firstborn was a talented young officer, and many elven maids found Astalder very handsome. Truly, even the most calamitous of events could have a silver lining! Errilam’s tragic death meant trouble on Suldanessellar’s borders, perhaps even a potential war with the human kingdom of Tethyr. Yet, if played properly, it could also bring about the downfall of the Archmage Ithilnien. Duke Goldfeather lowered his gaze, trying to conceal the sudden sharp gleam in his eyes. 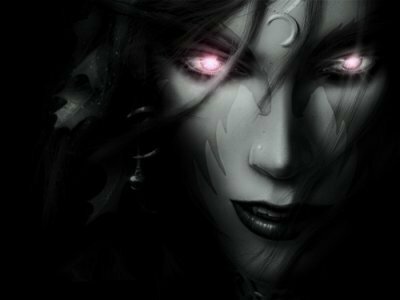 “I shall question the Archmage when he returns, after completing his private investigation,” Ellesime concluded calmly. If the Queen expected any vocal response from the members of Goldfeather family, she was disappointed, for she received none, although the young ones’ expressions looked apprehensive, while the Duke’s face showed no feelings at all. All of them, including the Queen, knew that Joneleth had been missing since the moment he had transferred his extravagantly rescued sister into the hands of the Green Spears’ scouts – the few who had taken part in the ill-fated hunt along with their leader. His task complete, the Archmage had opened a teleportation gate, and walked into its shimmering ellipse, without giving any explanations as to why and how he had turned up at the scene of the hunt. Since the psychic bond between them was still active, Ellesime knew that her lover was alive and well, and that he was not far away: almost certainly still inside the Wealdath. Her best hope was that he did not try to flee or hide from his Queen’s justice, but was simply biding his time until her anger would subside. Ellesime knew that she could not openly accuse Jon of premeditated murder – the stakes were too high to allow the truth to ever come out – yet the Queen did not relish having to cover up such a heinous crime, even for the sake of Suldanessellar’s peace and prosperity. She would have to improvise as the facts were uncovered, Ellesime decided tiredly. And sooner or later Joneleth would have to answer for the damage he had done to the city’s future, and to her trust in him. Deep inside her heart, the sparkle of faith in her consort still flickered, yet for the sake of her stately duties she had to stifle it, less it would blind her eyes and compromise her integrity. Visibly unruffled by the Goldfeathers’ all too obvious skepticism, the Queen continued with the interview, softening her stance only to permit Duke Menerlim to stay in the audience chamber. She knew him too well not to expect pressure and manipulation. However, his attendance now would buy her his support at the meeting of Council of Elders, when the time came to pass the final verdict. Guided at every turn by Ellesime’s incisive questions, the seven reconstructed the chain of events that had led to King Errilam’s demise. Alas, although there were gaping holes in their tale when it came to describing the human’s struggle with the beast and the ill-fated arrow that had brought down Errilam’s horse, Ellesime could not spot any inconsistencies in their tale. They had been at this less-than-pleasant task for more than an hour, as Ellesime slowly came to the inevitable realization of the brothers’ complete honesty, when a sudden commotion at the main entrance to the state chamber interrupted the proceedings. Joneleth gave the lonely satyr practicing his panpipes on a small clearing amidst the copse of giant blueleafs an acidic glare, but otherwise ignored it, as he levitated up above the sea of dusky-blue treetops. In this remote corner of Wealdath, the woods were quiet and almost empty of any intelligent life. He had lost the trail. His scrying had produced no tangible results, this lonely creature being his only catch after hours of relentless search. It was getting late, the sun was sinking towards the horizon, and the silver band of Suldanesse had faded into a string of glittering mica-shards, hardly discernible amid the deepening darkness of the forest. Reluctantly accepting that the pair of rogues whom he followed, had covered their tracks well, (most likely by means of alteration and illusionary magic), Joneleth decided that it was time to call the hunt off, at least until dawn. His own magic was fading, as he had been drawing on his arcane powers since daybreak, and it was becoming harder and harder to maintain concentration. He would have to rest soon if he were to have any hope of finding the pair the coming morning. Yet, the mage was not ready to withdraw. The fact that he had underestimated his sister’s paramours was embarrassing, and Jon had never been the type who could easily swallow humiliation and admit defeat. Finding the two was essential to restoring his good name in Ellesime’s eyes, and he could not allow something as trivial as fatigue to interfere with his plans. There was no question of returning to Suldanessellar until the task was accomplished, therefore some means would have to be found to continue the search. After the drama had played out, he had recalled their absence during Bodhi’s fight with the owlbear. While that fact could have been explained by the pair’s cowardice, their failure to return and join his sister’s retinue during the period of mass grief and confusion was telling. Combined with Bodhi’s testimony in regard to the deflected arrow, their involvement seemed almost certain. Joneleth had opened a portal leading nowhere and stayed in the area, secretly watching the hunt’s departure. The rogues had failed to appear. To alleviate his suspicions, he had even checked the paths leading back to the city – all without success. And then he had chanced to pick up the pair’s trail, leading south, towards the Starspears. He could not see how it was possible for Bodhi to bypass her geas and order Errilam’s killing, without causing herself serious physical harm. She could not have had the geas suppressed – there were no mages in Suldanessellar or in the nearby settlements capable of countering his enchantment. Exclusion of impossible scenarios had left Jon with the only acceptable hypothesis: most likely, the two stooges had murdered the King out of jealousy, and of their own accord. That conclusion made him seethe in frustration at his own shortsightedness. Perhaps, this time, Bodhi had truly been innocent, Joneleth decided with some degree of irritation, and he had only himself to blame for his failure to neutralize her lovers. He had never taken them seriously, yet under the right circumstances, even the sting of a mite could turn deadly. But regardless of the true reason behind Errilam’s death, he had to locate the renegades as quickly as possible, and bring them back to Suldanessellar before someone accused him of murder. He had no doubt that the Queen had already been informed of his presence at the scene of the killing. The alternative would have been to watch Bodhi being torn to pieces by the beast, and for all his lack of brotherly affection, letting her die like that while under the geas, was beyond his normal level of callousness. The sky above his head had turned slate-grey, except for the western quadrant, where the blood-red bubble of the sun was quickly sinking into the crazy mix of red and orange swirls, casting scarlet flecks on the dark waters of the river. The mage’s flight was becoming less and less steady. Soon he would not be able to maintain the altitude. All his other resources had been exhausted earlier today. He had no other choice but to find a secluded spot and rest. He finally found the place he sought on a small rocky islet, in the midst of the foaming stream of the Suldanesse. The isle was nothing more than a cliff, thrusting out of the dark waters of the fast-flowing river, with two jagged willow-trees clutching at the bare rock with their roots, entangled in the near-invisible cracks. There was just enough flat surface to spread his cloak, but as an extra precaution he used his belt to tie himself to the trunk of the sturdier tree. The waters of the river would serve as a natural defense – a safeguard most useful in his exhausted state. Perhaps this was not the best spot to fall into a reverie, but at present, Jon could not think of a better way out of his predicament. “The hour is so late that it has become early,” Yurick thought impassively. The fact by itself was of no importance: for all he cared the sun could sink into the Abyss and stay there till the end of time. But the idea had stuck in his mind, and he had toyed with it since crossing the threshold of the Palace, and trading the foggy grayness of the fading night outside for the bright magic lights in the endless corridors of the royal dwelling. Once inside, as ever, he had been reduced to the perspective of a measly insect – an ant running through a maze of holes and channels, drilled in a transparent sphere of green glass. “It is so late that it has become early,” he repeated aloud, addressing to no one in particular. “And they say the witch-queen’s powers wane when the sun ascends the sky.” The words rang hollow, even to him. Here, inside the heart of Ellesime’s Kingdom, the Queen’s presence filled every pore of reality. “She has already done enough.” Yurick’s voice was as expressionless as his face. It felt as if eons had passed since the morning when he had cantered through the chilly forest, following close on Errilam’s heels, as they rode to the hunt. Yet that fateful dawn had been only yesterday… and in another life. Through the slowly dragging hours of the day, Yurick’s heart had been drained of all joy and hope – his modest ambitions, and simple dreams had leached out, drop by slow drop, like the trickle of dark, congealing blood that had oozed from King Errilam’s ghastly wounds. All that remained were bleak, wretched despair, and dull anger. The young serviceman had led his nervous horse, laden with its dreadful, blood-soaked bundle, all the way back to Suldanessellar, then sat at his dead liege’s feet, as the gloomy High Priestess of Rillifane had examined the body and declared the death final. The damage was too severe to pray for the spirit’s return, she had explained sadly in heavily accented Common, and Yurick had believed her – he had known that from the moment he had first laid eyes on Errilam’s tattered flesh. “Don’t try to stop me,” the young serviceman replied tonelessly, pushing Rielev’s hands away, and continuing to march towards the carved wooden doors at the end of the brightly lit passage. “The guards won’t let you in anyway!” Rielev cried at Yurick’s receding back. It was pointless, he admitted belatedly. No one seemed to be inclined to listen to reason these days. Weary but light-hearted, Joneleth covered the last few paces of the swinging rope-bridge that separated him from the grand talan, upon which rested Suldanessellar’s Royal Palace. From the basin of a dried-up fountain, the twin statues of Sehanine Moonbow and Labelas Enoreth – male and female divine personifications of transcendence and longevity – watched him enter the Palace gates. He could not remember the blessed stream ever running dry before, yet he paid it no heed, pushing the disturbing detail from his mind, which at the present moment was occupied with far happier thoughts. The sun was blazing brightly in the sapphire-blue skies, and the fragrant summer wind tasted of myrrh and roses. He knew that Ellesime was waiting for him in the Rose Court – the small, secluded section of the Palace garden abounding in climbing roses of various hues, shapes, and sizes. They had been a couple for a bare few months, and their desire for each other had only now flowered from its first blind, overpowering, and often impatient lust, into a more refined passion between two intelligent adults whose spirits shared intellectual and emotional delights as greedily as their bodies shared physical pleasure. They were constantly finding newer, subtler ways to enhance their joy of each other, and their every meeting was still a discovery equal in complexity to an exploration of a new Plane. He crossed the marble-tiled front yard, bedecked with potted shrubs, thinking of Ellesime’s lush mouth, and proceeded through the shady corridors that led into the inner sanctum, while engaged in a peculiar exercise that consisted of trying to define the exact shade of the Queen’s fiery tresses. As always, his beloved eluded his attempts at classification, but for a while it provided a pleasant distraction. The Palace was oddly empty of both servants and courtiers; however once or twice he discerned the sound of running footsteps. Closer to the end of the passage, he thought he heard a muted exclamation from the shadow behind a carved wooden pillar, but whatever curious handmaiden or a careless guard was hiding there watching him pass, they must have thought better than to bother Ellesime’s consort, evidently on his way to a romantic assignation with the Queen. Finally he entered the Palace’s inner courtyard, opened to the skies and surrounded by the living trunks of the giant copper beeches that supported the whole structure. Normally, the center of the talan would have been submerged by the sparkling waterfall that poured from above, cascading through the wooden grating in the floor to the level below. Originating in the crown of the sacred grove, this stream was yet another of Suldanessellar's many magical fountains, and behind its watery curtain, lay hidden the secret staircase that led to the forest floor and onto the trail that ended at the very roots of the Tree of Life. Something was wrong with this memory – he realized at another level of reality – the waterfall had always been running when… But his mind wavered, and his attention was dragged back to the scene that was being played out before him. He ignored the staircase and the empty fired-clay bed of the waterfall, instead, opening a small gate on the left that led to his final destination. Here, at the sun-drenched heart of the Palace, the mundane outer shell of his life faded away, and all that remained was the touch of Ellesime’s cool hands on his neck, and the taste of her rose perfume on his lips. He found her in the farthest corner of the rose garden – in a small gazebo, overgrown with flowering vines. The Queen reclined on a silk-upholstered sofa, her left hand supporting her delicate chin, while her other arm, bare to her perfect round shoulder, (the wrap of green chiffon she wore left little to the viewer’s imagination), traced the line of the text in one of the many scrolls she had been studying while awaiting him. His whisper was lighter than the beat of a butterfly’s wing, yet she sensed more than heard his call, and her face began to light up with the anticipation of joy. For a split second, Ellesime’s luminous eyes lingered on the spot she was reading, even as the corners of her mouth trembled in a precursor to a smile. Then she raised her eyes. Her face froze in sudden horror. The look that crossed her face – the stunning mix of fear, pity and revulsion – was, perhaps, the cruelest blow that he had ever experienced in his life. Her hands flew to her throat, as if she was trying to stifle a scream that was ready to escape from her mouth; her chest heaved in convulsions, and he realized that she was about to become violently sick. “What is wrong with you, my love? Why are you looking at me like that?” he was able to mutter through suddenly numbed lips. Ellesime stumbled to her feet, her scrolls rolling all over the floor, and backed away towards the exit, as if she saw a demonic apparition in place of her lover. “Jon… you… what have you done to yourself? !” She gasped chokingly. “My love?” he repeated tentatively. Perhaps the sound of his voice was the last drop that overflowed the cup, for Ellesime screamed like a dying bird and dashed past him, stumbling on the folds of her fanciful gown. Almost automatically, he extended his hand to steady her and prevent her from falling. But even as his fingers grazed her skin, the shock and horror that were contorting her face became a grimace of such intense revulsion that he gasped and pulled his hand back, as if burnt by fire. Only then did he suddenly notice that both of his hands were encased in heavy leather gloves. That was odd – he was certain the gloves had not been there when he had entered the garden. Ellesime gave him one last look of intense hatred and revulsion, and fled the pavilion, leaving him empty-minded and shaken. As he stood there, gazing after her in bewilderment, he noticed on the floor of the gazebo a small object that had obviously fallen out of the folds of the Queen’s robe as she had escaped their love-nest. He imagined that Ellesime had checked her appearance in the hand mirror when she had first heard his footsteps. Feeling dead inside, and shaken to the very core of his being, he picked up the rounded piece of polished glass in its filigreed silver frame, and cast a glance into it. The face that looked back at him from the depth of the small mirror was that of the living dead: a yellowed skull, with a few remaining wisps of silver-white hair, crumbling dark teeth, and tattered fragments of dried skin peeling from the cheek-bones. The stump of a tongue, rotting and dark; the shriveled eyes in their fleshless sockets; the worms writhing amidst the last few morsels of flesh, all indicated that something had gone terribly wrong.